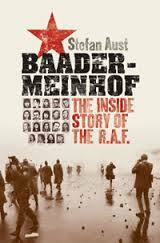 "Arafel": "The Baader Meinhof Complex"
Quote: "Germany 1967. The children of the Nazi generation have grown up in the devastation their parents created. They vowed fascism would never rule again. In their fight for freedom they lost themselves in the cause and ignited a revolution around the world. 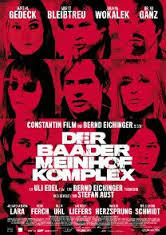 Meet the original faces of terrorism, the Baader Meinhof Group, in this Academy Award and Golden Globe nominated film based on the true story of the Red Army Faction. According to German authorities Andreas Baader, Gudrun Ensslin, and Jan-Carl Raspe all committed suicide in their Stammheim prison cells early on the morning of 18 October 1977. It is perhaps understandable that many Germans had trouble believing them. The Red Army Faction cell block had been described over the previous five years as the most secure prison block in the world. The press had been full of accounts of lawyers being searched for almost an hour before being allowed to visit their clients. So when it was announced that Baader and Raspe had shot themselves with two guns that they had smuggled into their cells, after listening to reports of the failed Mogadishu hijacking on smuggled radios, and communicating with each other through an clever “phone” system utilizing unused electrical wires between the cells, many Germans were clearly incredulous, and remain so to this day. Indeed, it is an article of faith among German leftists that the were murdered by the state. The very best analysis of the events of “Death Night” is Stefan Aust’s “The Baader-Meinhof Group.” Though Aust does not directly say that the three RAF leaders committed suicide (and a fourth person, Irmgard Möller, attempted suicide by stabbing herself with a sharpened bread knife), Aust does demonstrate that this is the most probable course of events, or at least was entirely possible. He shows how the RAF lawyers made a mockery of the “strict” searches and quite probably did smuggle in the guns and other contraband. Aust also shows how the prisoners could have easily hidden the weapons. This subject is still serious business in Germany. Quite recently the publisher of a semi-underground newsletter was fined over $1,000 for saying that Baader, Ensslin, and Raspe were murdered. Clearly the modern German state, with memories of their Nazi past in its head, does not like to be accused of murdering its own citizens. The video of "Urban Guerilla" (Hawkwind), containing clips from the movie has finally been removed...hard-hitting stuff like that should be seen....shame..